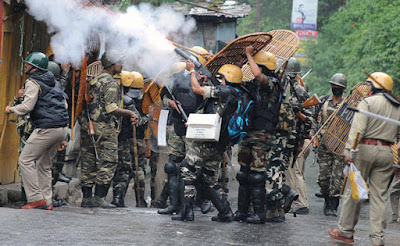 NEW DELHI: The Supreme Court today allowed the Centre to withdraw the remaining four companies of Central Armed Police Forces (CAPF) from West Bengal's troubled DarjeelingBSE -3.48 % area after March 8, amid the state government's demand that they be kept for four more weeks. A bench headed by Chief Justice Dipak Misra settled the dispute between the Centre and the state over deployment of CAPF companies in Darjeeling area which was affected by the agitation of the Gorkha Janmukti Morcha . A bench, also comprising Justices A M Khanwilkar and D Y Chandrachud, considered Attorney General K K Venugopal's submission that the deployment of the central armed forces fell under the Centre's administrative domain and allowed it to withdraw the remaining CAPF companies. The apex court set aside the Calcutta High Court order that had restrained the Centre from withdrawing CAPF from the state's hilly regions on the ground that normalcy had not returned and said the pending case at the High Court would now stand disposed of. The apex court had earlier permitted the Centre to withdraw four of the eight CAPF companies from Darjeeling and Kalimpong. Before that, the Centre was allowed to withdraw seven of the 15 companies of CAPF from Darjeeling and Kalimpong districts for deployment along the borders of Jammu and Kashmir and in the northeastern states besides the then poll-bound states of Gujarat and Himachal Pradesh. The Supreme Court today allowed the Centre to withdraw the remaining four companies of Central Armed Police Forces (CAPF) from West Bengal's troubled DarjeelingBSE -3.48 % area after March 8, amid the state government's demand that they be kept for four more weeks.